The Grampians National Park holds some of the most spectacular views in Victoria. 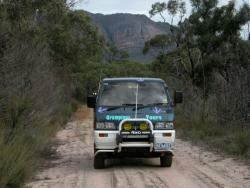 Grampians Personalised Tours & Adventures, with over 10 years of experience in nature tourism, provide a rofessional touring service operating from the heart of the Grampians. Our ECO guides are enthusiastic, have expert local knowledge, and deliver a quality-personalised service. This places us in the unique position to be able to share the Park's abundant natural delights with you.